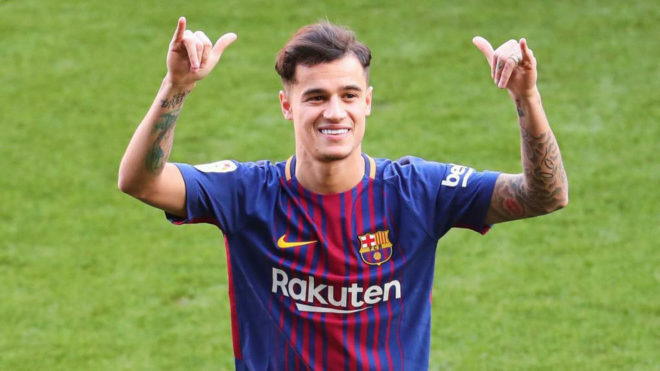 Few expected Philippe Coutinho to become a Barcelona player so early in the transfer window and yet it was his new club’s patience that the midfielder praised once he was unveiled on Monday. With a move in the summer denied by Liverpool, Coutinho’s prayers were finally answered when the two teams struck a 160 million euro deal in the first week of January. “[This is] the realisation of a dream,” beamed Coutinho to the assembled press. “I have to thank many people; God, my family, my wife and my daughter. “I also want to thank all the efforts of Barcelona, they had a lot of patience. Having taken in the 3-0 win over Levante on Sunday, Coutinho spent the next day touring the club facilities and cannot wait to pull on the Blaugrana kit. “I’m very anxious to get started. Speaking in Spanish to 101 media outlets and 161 accredited journalists, 43 of them international, Coutinho spoke about the impact of his good friend Neymar on the move. “I have talked to [Neymar] and he spoke very well about the city and the squad,” he asserted. “I have also spoken to Paulinho and Luis [Suarez]. “I hope to be very happy here. “I play with Neymar in then national team and we’ve been friends since we were young. He is a great player, but we have different characteristics, I came to Barcelona to find my own space. Coutinho was then pressed on why he chose Barcelona, who he can help steer to league title glory this season while cup-tied for Europe. “This is Barcelona, the best team in the world, and the one with the best players,” he stated. “Great idols of mine have come to play here and great idols of mine are still here. The answer is very easy.